Agrigento Sicily pictures, photos. Images of the Agrigento Greek Temples to buy on line as stock photos ot photo art prints. This Agrigento photography collection is selling photos of the Greek Temple of Juno Lacina and Concordia as well as pictures of the Temple of Hercules. 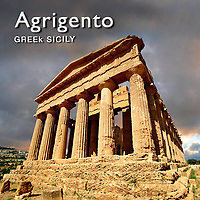 Buy Royalty free Agrigento photos, Rights managed Agrigento pictures or contact us to discuss prices.